James Holdstock donated a kidney early in 2013 as part of a Paired Donation Scheme. 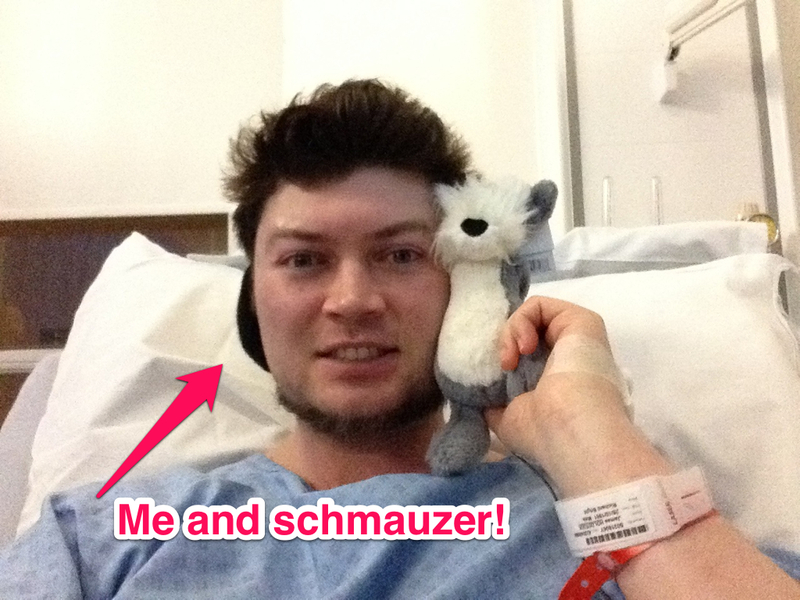 Schmauzer and I were introduced in March – I was in Guy’s Hospital, having just donated my left kidney and Schmauzer was a gift from my wife and mother-in-law. I am part of a ‘Paired Donation Scheme’. The way that it works is that people with two healthy kidneys can quite happily donate one without any long-term ill effects. At the same time, someone else donates a healthy kidney and they are effectively ‘swapped’, meaning that both your loved one and their loved one gets a healthy, working kidney. Not many people know about kidney swaps or altruistic organ donating, but it’s an incredibly important procedure that can drastically improve the quality of life for the ones you care about the most. Of course, I was scared. I knew that the recovery would take a while, but the hospital staff were excellent. They talked me through everything that I would need to do to make sure I was well prepared physically, mentally and emotionally. My anxiety though was completely outweighed by the results. Not only did my loved one have a working kidney, but my donation had saved someone else from dialysis (which can take up days every week) and made things easier for them and the people they care about. Once I’d recovered I wanted to continue to raise awareness and funds for kidney research whilst challenging myself in the process. Schmauzer, myself and my friend, Anthony, completed a physical challenge to prove that you can lead an active healthy life after kidney donation. We completed the ’24 Peak Challenge’ on October 11 and 12, 2013. This meant ascending 24 Lake District Peaks in a 24-hour period. Each peak is over 2,400 feet high and we did this over 2 grueling days! How do I go about donating a kidney? Give a Kidney – One’s Enough is a registered charity in England and Wales (1143576) and in Scotland (SC045767).